1. A-6E Intruder. VMA(AW)-533 "Hawks", MCAS Cherry Point, NC - Sheikh Isa AB, Bahrain, tail code "ED". 2. A-6E Intruder VMA(AW)-224 "Bengals", MCAS Cherry Point, NC - Sheikh Isa AB, Bahrain, tail code "WK". 3. A-6E Intruder VA-155 "Silver Foxes", USS Ranger, tail code "NE". 4. 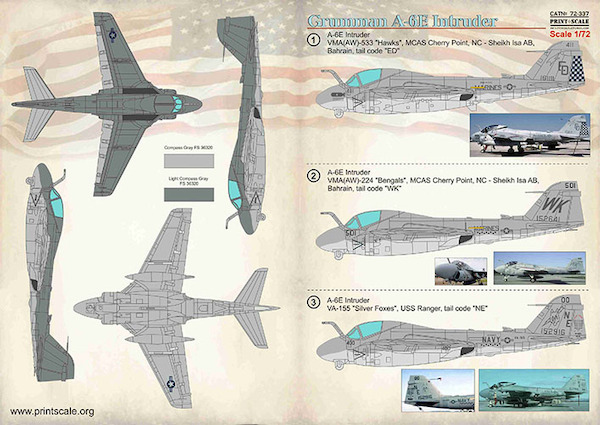 A-6E Intruder VA-65 "Tigers", USS Theodore Roosevelt, tail code "AJ". 5. A-6E Intruder VA-145 "Swordsmen", USS Ranger, tail code "NE".